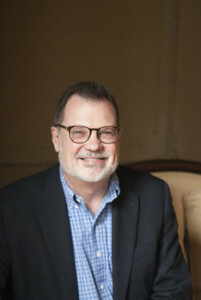 Jeff Spark is a Fellow at the Sagamore Institute and a board member of the Southeast Neighborhood Development Corporation (SEND) where he serves as Chairman of the Twin Aire Ad Hoc Committee focusing on renewing that neighborhood of Indianapolis. The decision to do this type of work came during a time of transition for him, as he sought to discern his next steps after leaving the Heartland Film Festival. Jeff explained it this way: “When I was transitioning out of Heartland, I was wrestling over what is next. I thought originally I was going to get into the for-profit world, of development. In the beginning, I had several opportunities but they were all part time. So I decided to go off on a retreat to wrestle with what was to be the focus of this next part of my journey. I was originally going to do a one-day retreat. I looked at the calendar and chose a date and wouldn’t you know it the very next day in my morning reading was the story of Jonah in the belly of the whale. After reading it I couldn’t get it out of my head. I thought, ‘What is going on here?’ and then it hit me: not one day but three days. You really need to get away, into the belly of the whale. No, you need to totally get away from everything. So I emailed some friends who had places that would work and Don Palmer responded that I could use his cottage on Lake Lemon, just south of town. I decided to take a bunch of books with me. I’m not much of a reader, but often spend most of my retreat time reading. Friday morning I get up and I pull my books out of my backpack and the one that stood out was Augustine’s Confessions. I remember thinking, ‘I don’t know about this, seems pretty heady, but I’ll read the intro and if it does something, maybe I’ll keep reading the book, and if I don’t get through it there are others I can read.’ So I pick it up and devour it over the next two days, which is very uncommon for me. The third day I found myself wrestling through what I had just read and the decisions ahead of me, leaving, like most retreats, without a significant revelation. I come back facing making a decision in a few weeks, before the end of the year. As I wrestled with the decision, the retreat time swirling around in my head, it began to dawn on me that I’m not a for-profit guy, I’ve never been, except for one small stint early in my life, I’ve always been a non-profit guy, and I love community. That’s all I’ve ever really done all my life. I helped build community at the Indiana Children’s Christian Home in the 80’s – where we served young people struggling through life. Then with Heartland I helped bring together a community of filmmakers and a community of volunteers with significant results. But I had never developed community in a community. In the past several years I have spent a lot of Sundays on the porch with friends, including Bill Taft who is the Executive Director of the Indianapolis LISC offices and arguably one of the leading minds in community development in the city. So we often found ourselves talking about how to make Indianapolis stronger. I was very taken and intrigued by his vision for strengthening a city by focusing on community development in the neighborhoods. And I thought, ‘I want to be him when I grow up. Jeff had found his vision for community. At the end of 2013, Jeff joined the SEND board and the housing committee—two months later becoming its chair. SEND had recently decided to focus on Twin Aire, a neighborhood just east of Fountain Square. Though he didn’t know much about the neighborhood, as he got to know the people he realized it was the community he was meant to serve. “They have a strong desire to make their neighborhood stronger,” he explained. Many of the residents have lived there since the 1950’s and 60’s, a heyday brought on by the opening of the Twin Aire Shopping Center. When other shopping centers began opening up, Twin Aire lost a lot of business—and along with it, the vibrancy of the neighborhood. An IUPUI School of Social Work survey and demographic study of Twin Aire shows that the neighborhood has a low graduation rate, low median income, and is twenty-one percent Latino. Most importantly to Jeff, the survey revealed that the community truly cared about improving. In early 2015, Jeff presented the study to the area neighborhoods and in September, the first Twin Aire Neighborhood Coalition meeting in its history took place. Jeff was hoping for fifty people, and sixty-three came: a “phenomenal turnout.” Not only was there a larger number than expected, but by the end of the meeting, the community members had chosen their ten steering committee members and set the dates for the first two meetings. The next goal is to hold a community brainstorming session in November that Jeff calls a “development charrette,” a time where community members will break into groups, share ideas and dreams for the future, sketch out these ideas about how to utilize the neighborhood’s assets, and then reconvene to assess the group’s various solutions and ideas. Specific areas of interest include the decommissioned Citizens Energy Coke Plant, the land which was formerly the Twin Aire Drive-In, Twin Aire Shopping Center, the Pleasant Run Trail, the intersection of Rural, English, and Southeastern streets that comprise the town center, and other infrastructure needs. Many of the 4,000 Twin Aire residents who have been living in the neighborhood for most of their lives also want to retire there. TWG, headed by Joe Whitsett, recently bought School 21, and plans to turn it into seventy-seven senior housing apartments. The school is centrally located in Twin Aire, and it’s a beloved place to many former students there. Regular School 21 alumni gatherings bring together as many as 500 people. Ideas have also been tossed around concerning how to improve the main intersection of Rural Street, English Avenue, and Southeastern Avenue. It is a confusing intersection, which makes walking and biking a dangerous endeavor. As such, the opportunity for neighbors to interact and access the neighborhood’s amenities by foot or bike is hindered. Efforts are being made by Reconnecting Our Waterways (ROW) to redevelop the Pleasant Run Waterway and the path that runs along it. There are also many opportunities with the Citizens Coke Plant using the 100 plus acres there and the neighboring Twin Aire Drive-In site for recreational green spaces, commercial and light industrial development, and housing. The Near East Side, Twin Aire included, has recently been designated as one of the twenty national Promise Zones in the country. The Promise Zone is an initiative put into place two years ago to accelerate the development of high-poverty—but high-promise—communities throughout the country. It brings Federal technical support and preference for Federal grant applications that seek to improve opportunities for job and economic development, education, and public safety in that specific zone. Though a Promise Zone designation does not come with financial support, it provides better outcomes for grants that are so crucial for making big strides in neighborhood development. I asked Jeff how his work through Visioning Community ties into the concept of the excellent community member. He responded that it involved not just the importance of a healthy urban community but also the complexities of doing it well: “Mayor Hudnut used the illustration of a doughnut. You can’t have a doughnut of a city, you can’t have the suburbs strong and the inner city weak. You’ve got to have a strong urban core…if this city is going to be strong, those [inner city] neighborhoods need to be strong. And we are starting to see that, we’re seeing it in Irvington, in Fountain Square, in Bates-Hendricks and others, but each one needs to be strengthened. And Twin Aire is right there connecting those neighborhoods to the city core. To me, Twin Aire could be a model for other neighborhoods. The Indiana Compassion Map allows users to explore the richness and diversity of over 11,000 of the state’s community healing organizations, learning more about what they do and where they are located. Bright Ideas Indiana is a project of the Governor’s Management Performance Hub (MPH), the Indiana Family and Social Service Administration (FSSA), and the Indiana Office of Technology (IOT). It highlights promising practices by Indiana nonprofits to encourage peer-to-peer learning and innovation. The state agencies commissioned the Sagamore Institute for Policy Research (SIPR) to conduct research statewide to identify excellent social service nonprofit organizations.